The grounds of seaside Hulihee Palace have suffered damage from Friday’s early morning tsunami. While the basement of the palace is flooded, it is still unknown if the first floor of the palace, with its many artifacts, suffered any damage. Long-time palace administrator Fanny Au Hoy said several treasured artifacts were removed from the landmark Thursday night in anticipation of the tsunami. “We filled three vehicles,” she said. Local law enforcement is keeping people away from the downtown Kailua-Kona area and Au Hoy has been unable to verify the condition of the palace’s interior. She said there is sand and gravel on the palace’s oceanside lanai. 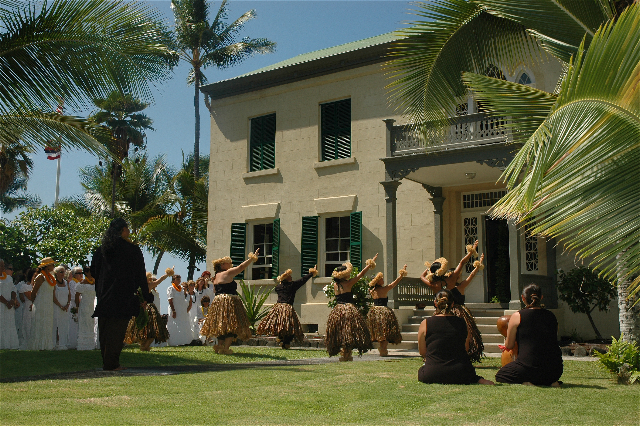 Au Hoy confirmed the palace’s caretaker cottage has been damaged, as well as the lanai of the next-door Kuakini Building, which houses the palace’s kitchen and meeting area. In addition to debris being spread throughout the palace grounds, Au Hoy said part of the slab topping the seawall has been damaged. “It’s in the area by the flagpole,” she said. The palace, which is managed by the Daughters of Hawaii, will remain closed until further notice. Au Hoy noted the Honolulu office of the organization has been appraised of the palace’s current situation. Hulihee Palace reopened in September 2009 after receiving a $1.5 million renovation to repair damage suffered in the October 2007 earthquake.